Ongakubaka: Afrirampo - Baka ga Kita! Baka ga Kita feels more like a documentary than an actual album. Recorded in 2004, the duo traveled to Cameroon and lived with a tribe of Baka Pygmies for three months, recording improvised call and response sessions with the people. 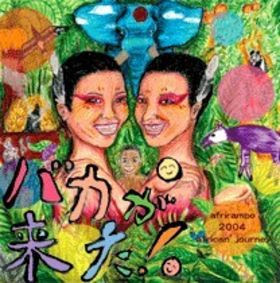 Overall, Afrirampo (or Afuriranpo if you're in Japan) has released an album that has been suprisingly catchy for me, and the idea alone makes it much more profound than a good majority of other albums. I'm in love with the drummer. Thanks alot, I've really been into Afriampo ever since I first got - Kore Ga Mayaku Da awhile back, but haven't been able to find any of their other albums. They've just got this really great energy - there is no one else like them. and now I'm really excited to give this one a try! Have you ever listened to Acid Mothers Afriampo? It's a collaboration between - no surprise, afriampo and acid mothers temple. It's pretty fantastic. Please reupload the album , the link is dead and i cant find it anywhere!